Imagine, if you will, the following scenario. The summer is in full effect and the dog days have everyone trying to beat the heat. You're sweltering. It feels like an oven. Like many Angelenos, you too wish to find respite from the oppressive rays of the midday sun. What do you do? 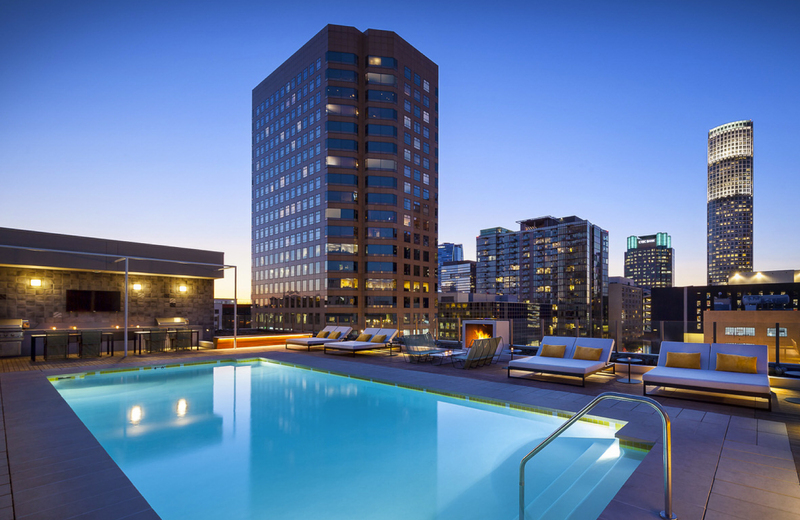 If you're at Eighth & Grand, you can head over to the pool and take a well-deserved break. What's so special about a pool, you ask? "Where's your imagination?" one might reply. As anyone who knows about the pool life will tell you, fun is aplenty when you think just a little bit outside the box. What Can You Do At A Pool? The range of possibilities is vast, and the pool at Eighth & Grand is accommodating to most of them. Sure, you could just get in the pool and swim (it's a perfectly acceptable choice), but why not mix things up a little? We're not talking about kiddie pool games (though, realistically, those could be fun too), there are loads of water-centric activities for adults that are just as exciting. Here are just a few of the things you can do when you're ready to kick back and relax. You'll need some other participants for some of these, so it's also a great opportunity to get your neighbors in on the action and make some friends. By far the most exhilarating thing you can do at the pool is participate in some friendly pool games. They're easy to play, easy to learn, and a great way to foster some social interaction. You can start small with a game of Simon Says. Most adults remember this popular playground game, but it takes on a new twist when you adapt it for the water. Now, instead of the unlucky losers who jump the gun being cast to the benches or bleachers, the impatient players have to get out of the pool. On a hot day, you'll want to stay in the game as long as possible. The winner is the last one still standing in the water. If you've got a slightly larger group, you could also try your hand at a game of Marco Polo. It's long been a favorite because of how simple it is. The designated "Marco" must remain blindfolded and attempt to tag the other players by following the sounds of their voices. When they yell "Marco," the others are compelled to respond, "Polo," revealing their position. When one is tagged, they become the new Marco and the process repeats anew. Ratcheting up the complexity now, you can give a spirited round of Pool Volleyball a go. You'll just need a regulation volleyball (or and oversized beach volleyball if you're dealing with unskilled players) and a solid net. Pool volleyball doesn't exactly have rules in the same way that land volleyball does, so just form teams, improvise, and do try to at least get the ball over the net. Another solid team game is Pool Frisbee. Grab your Frisbee, split into groups, and set up some goals. Take turns as the scoring and defending team, with the scoring team (obviously) trying to get the Frisbee into the defending team's goal. You can mix things up by having players on the outside of the pool that you can pass too, and can adjust the rules to best fit the speed of play you and your friends desire. Of course, you don't necessarily have to be in the pool to enjoy the atmosphere. One of the great things about the pool at Eighth & Grand is that it perfectly facilitates relaxing on the deck and the pool's exterior. You could rest in a deck chair and read a book. You could catch up on some work while conversing with friends. You could take a well-deserved nap. You could even sit around and do nothing at all if you wanted—soaking up the rays of the midday sun and perfecting your subtle tan. Under the cabana, you'll find more room to stretch out and do as you please. Grab a drink, set up a board game and play around, have a spirited match of cards. Do whatever you like, and do it with the comfort and style you can only find at Eighth & Grand. All of that, and there's still more waiting for you within the confines of this elegant apartment complex. The fabulous resident amenities here don't end with the pool—they continue, in a big way, once you retreat back indoors. You could, for instance, head to the fitness center to work on your physique. The 5,400 square foot space provides more than enough room to get a spirited workout on any number of the machines, lift some free weights, or take that group class you've been meaning to try out. Or perhaps you'd like to take a load off in the commons or the rec room? You could strike up a conversation, grab a seat and enjoy a drink, or pass the time with friends in a group writing session or playing a fun game. You might even want to check out the pet spa, if you've got a four-legged companion, that is. Your furry friend deserves attention too, and this lavish retreat is the perfect place to show it to them. It's clear now why Eighth & Grand is considered "A home that's hard to leave." You've got all you need under one roof. Prospective residents can take their pick of the many spacious floor plans the complex has available. They're built for comfort, with living spaces, bathrooms, and kitchens designed for superior convenience. Even when you do need to leave the confines of the building, you're right in DTLA, so everything the Downtown area has to offer is right at your fingertips. Come see what the fuss is about—check out Eighth & Grand today.